Mark Cuban, the billionaire owner of the Dallas Mavericks, recently warned the NFL to watch its overexposure. Without reeling that exposure in some and understanding its core mission, the league was at risk of destroying itself. The NFL forgot its core mission this weekend and turned the NFL Draft into political and societal theater topping it off with openly gay Michael Sam crying and kissing his boyfriend on ESPN. Will get to that in a moment. These 300 pound stacks of muscle walk up to this guy, hug him and break down in tears, crying hysterically on his shoulder. Did Jesus return in the form of Goodell and did these players just meet the Son of God? Come on men! Get it together. Before he made his Neil Armstrong-esque “One Small Kiss for Man,” lip locking with his boyfriend for the world to see, he was crying uncontrollably and unable to speak. Yes, tears of joy no doubt for being drafted into the NFL and also being the first openly gay player in the league, but still a blubbering mess. What the hell was St. Louis Rams’ coach Jeff Fisher thinking on the other end of the phone? As my mother told me as a kid, you don’t cry on the street. I will add you don’t cry in front of your boss either! Come on man. Get it together. 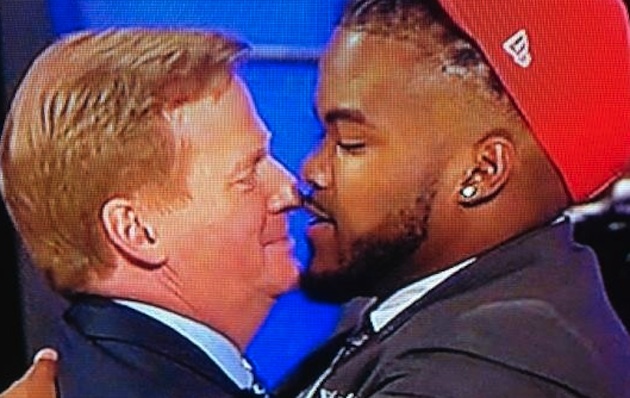 When did all this “bromance” and sensitive male stuff become part of the NFL? Hugs. Crying. Now kisses. What has become of the sport that gave us Vince Lombardi, Bronko Nagurski and Mike Ditka? 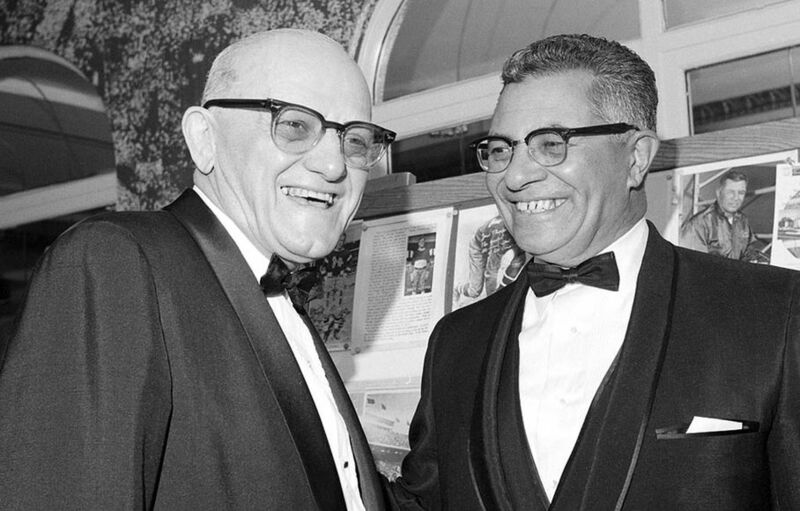 I can’t imagine Lombardi laying the lip lock on George Halas of the Bears, let alone hug him. Back in the day it wouldn’t have been…how shall I say…appropriate. Women didn’t want to kiss these two guys. Lombardi, Halas, Tom Landry and Mike Ditka spun in their graves this weekend with all the “bromance.” Well Ditka would have turned over if he were dead. The NFL allowed their game, one that used to be the example of American toughness, to be taken over by the George Clooney’s of the world. Then came the kiss. I’m thinking the NFL, masters when it comes to the press and public relations, had this all planned out. Here’s what I think happened. As the draft went through its rounds and Michael Sam fell lower and lower, someone made a telephone call to the Rams and suggested the Rams take Sam since he played college ball in Missouri. If he weren’t drafted it would look like the league was homophobic and that wouldn’t be good. 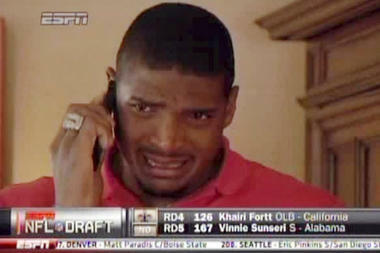 With the 249th pick, the St. Louis Rams picked Michael Sam. A telephone call also went to ESPN. Like anything, when you get to be too big and powerful, you’re no longer happy focusing on what made you great and you start looking for ways to change society both socially and politically. Mark Cuban is a bright guy. By the way, how will the NFL handle all the negative publicity when Michael Sam gets cut? Just asking. This is the kind of thing Vladimir Putin wants to keep out of Russia and may God be with him. And Russia is gonna kick out asses!